Outstanding in appearance and taste, this dark chocolate fruit and nut mix is a collection of decadent, delightful goodies. 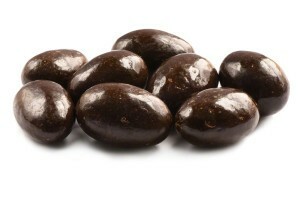 A rich dark chocolate coating conceals bits of fruity sweetness and a buttery flavor that's sure to please your palate. The crunch from the almonds, cashews and peanuts and the chewiness of the raisins gives you an ideal variation of texture. Dark Chocolate (Sugar, Cocoa Butter, Milk, Chocolate Liquor, Soy Lecithin (An Emulsifier) and Artificial Flavor (Vanillin), Coffee Beans, Malt Balls, Cherries, Cranberries, Almonds, Cashews, Pecans, Gum Arabic, Corn Syrup, Sugar, Certified Confectioners Glaze. One bag contains about 130-150 pieces. No problem taking a while to eat through this bag. Perfect for a handful afternoon snack at the office. Able to share because there is so much, and you don’t have to eat a lot at once because it’s so rich and fulfilling in little handfuls. All the nuts and fruits are fresh and the chocolate is the perfect level of sweetness. We liked this but it wasn’t necessarily a ‘fruit and nut’ mix.. there were a ton of coffee beans and malt balls. We like both but it wasn’t what we were expecting. Otherwise the chocolate is still good and I’m sure it won’t go to waste! Nutstop changed this product but one of my customers wanted it. They mixed it up special for me and it’s really good. great mix of fruit and nuts (especially the orange peel flavor), and the dark chocolate is rich. Earn up to 122 points.